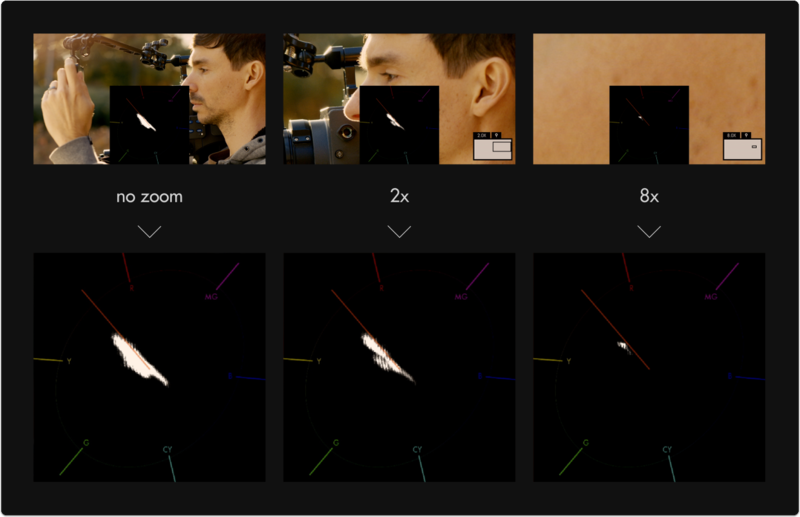 Though generally not considered as 'mission critical' during shooting as exposure scopes such as Waveform & Histogram, the Vectorscope plots the chromacity, or the hue + saturation of your image onto a color wheel so you can help gauge complimentary color, ensure skin tones are being colorized properly, to visualize how overall scene color is being placed, and where potential adjustments may need to be made in general. 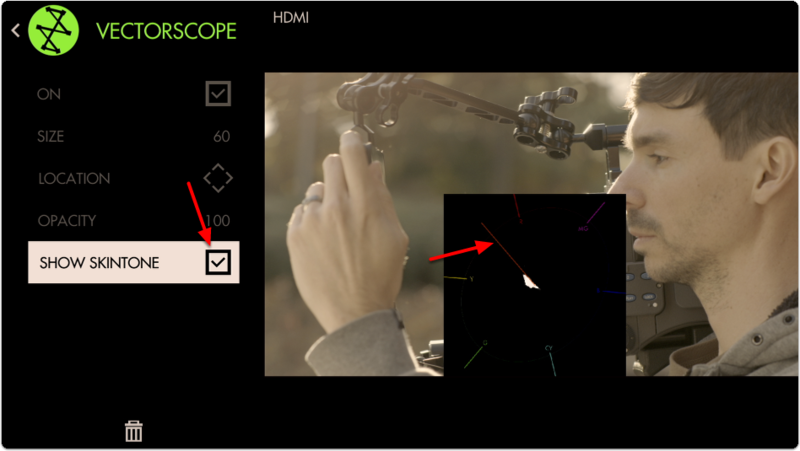 In this section we will add a Vectorscope to a page and use it to light a scene with complimentary colors. 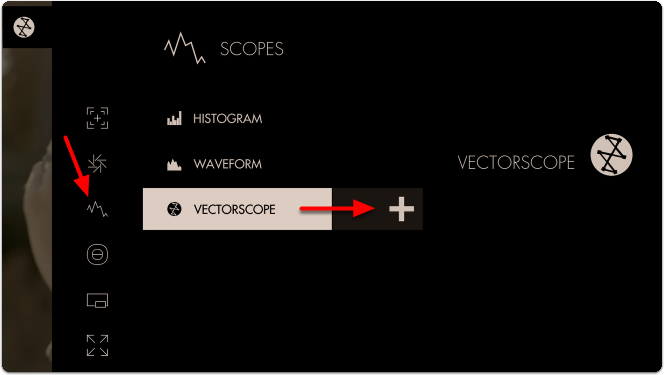 Navigate to Scopes > Vectorscope and select the '+' to add it to the current page. A Vectorscope appears at the bottom of the image. The 'blob' is largely contained in the center of the graticule/crosshairs which means the colors of the current image are not very saturated (which is especially true as this footage is using log-based gamma). The Vectorscope represents saturation as distance from the center of the circle, and hue as the angle around it. If we apply a LUT to this page, the Vectorscope reacts by expanding its plotted area. The scope confirms that we are viewing a more heavily saturated image after applying the look. 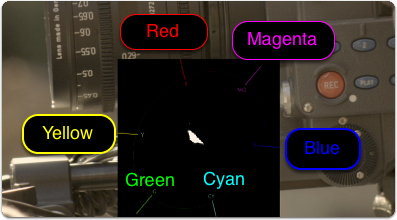 The Vectorscope uses the same layout as a color wheel and therefore principles of color theory apply - for example we can achieve complimentary colors by ensuring our scene plots to the graph on exactly opposing sides. Perhaps the most common example of this is the famous/infamous 'teal/orange' look popularized in Hollywood where skin is orange and nearly everything else gets colorized as teal. We can edit some settings by navigating right or tapping the right arrow when ‘Vectorscope’ is highlighted in the toolbar. You can adjust the SIZE of the graph for better visibility. At this stage feel free to use Size & Position or Crop & Scale to arrange the image and scope so that they don't overlap. 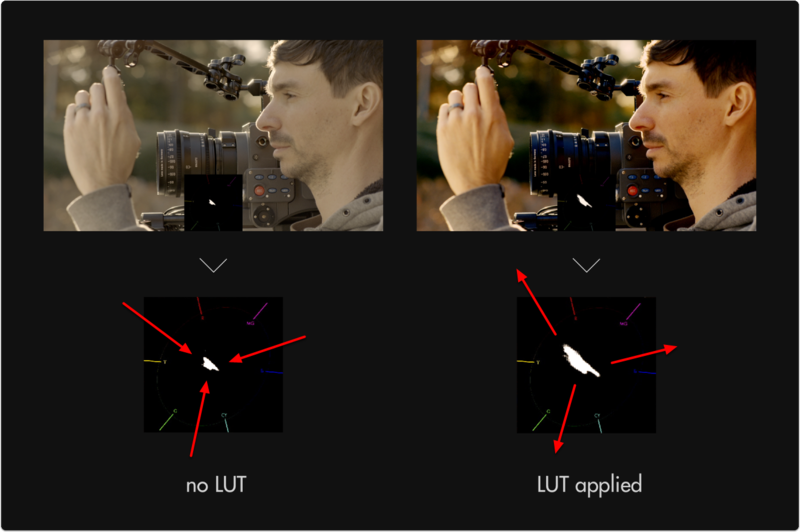 Next let's enable SHOW SKINTONE - this provides a line on the graph for where to keep skintone hues for the most natural result under neutral lighting. Because the entire image is being plotted to the graph all at once, we can check the status of individual areas by using Pixel Zoom in combination with the Vectorscope for spot meter functionality! Press up on the joystick or pinch-to-zoom on touchscreens while the scope is activated to see its effect. Zooming into an area consisting of only skin tones reveals the exact hue in which they plot - the result is slightly toward the yellow side - this is the result of a golden reflector which was used to bounce light onto the face. If we had used a silver reflector, the facial tones would rest precisely on the skin tone line. Access Vectorscope tool settings menu by navigating right or pressing the right arrow when Vectorscope is highlighted in the tool list. 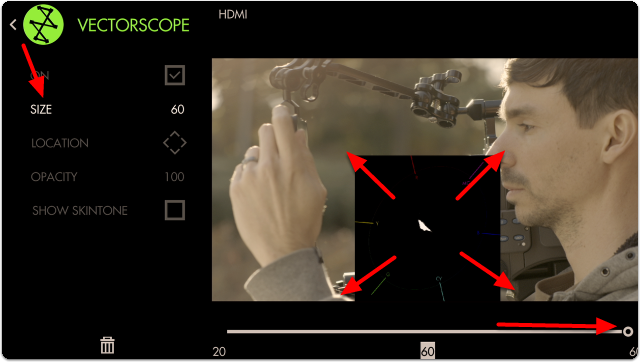 Adjust the size of the Vectorscope for best viewability. Arrange the Vectorscope on-screen using various pre-set locations. Set the transparency/opacity of the Vectorscope graticule/graph. Displays a skin-tone line directly on the Vectorscope to indicate where to place skin color during lighting to achieve a neutral, natural result.